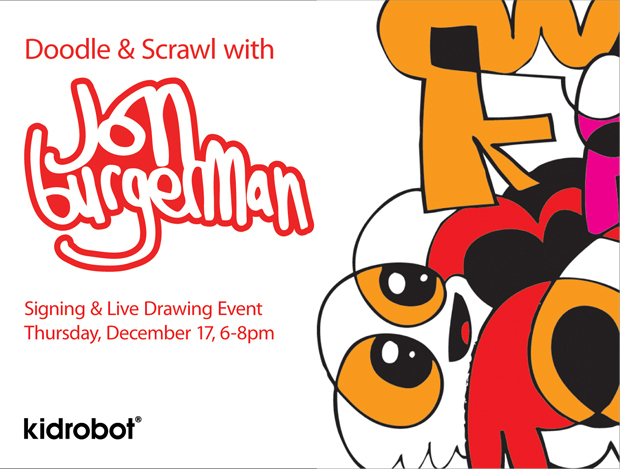 The one and only Jon Burgerman will be making a special appearance at kidrobot London this Thursday. The signing and live drawing event will take place at the recently opened London store at 6pm – I’d recommend getting there even before that, because if the turnout is even a fraction of the crowd that lined up for the store launch night with Tado, then it’s bound to be a busy one. Jon Burgerman is a kidrobot favourite, with this year’s Rainy Day Dunny and his Dunny as part of the awesome 3 Bears series being highlights in the kidrobot catalogue. Bring along your favourite Burgerman Dunny to be signed, or purchase one of the new Munnyworld blank forms and have him doodle your own custom! Either way, get down to experience a great artist at work – more info on Burgerman and his other art works here.